Here we have a Fire marker – the popped anterior tibial tendon. This dorsal area of the foot is the general reflex for the pelvic region, including reproductive system, inguinal region and lymphatics, and the muscles and bones of the lower core. The popped tendon indicates potential pain, inflammation, overuse and increase in muscular tension somewhere in this area. 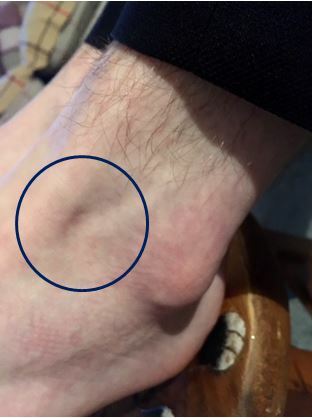 The excess tension here has created a little cave just below the popped tendon, indicating strain, fatigue and weakness. The little cave would be regarded as an Air marker, and this would make sense that the Fire from the inflammation is leaving deficiency (burnt out). In addition we can also see an inflamed and over-protruding lateral malleolus (ankle bone) showing that the hip is also affected. This male client suffers with groin pain on the left side, stemming from a childhood injury (a tear), and continues to have problems while playing sports. To balance Fire we want to reduce the forest fire to a gentle hearth-side glow, so activities like restorative yoga and gentle swimming would be recommended. Other activities such as Tai Chi might also benefit. In addition, ensuring hydration and diet are optimal. From a mental/emotional perspective, this would indicate fiery and inflamed relationships with family and those whom we are close; sparks could well be flying and as a practitioner I tread very carefully. Venting and letting off steam about these issues would help, either with a neutral party or by journaling. Routine and boundary setting within the relationship is also needed, as a raging fire can easily get out of control. Once the Fire has gotten under control, it is then time to gently nourish and strengthen the remaining deficient terrain. Jackie Marsden MAR is a qualified reflexologist, clinical acupuncturist, and foot reading practitioner, working from Elder Cottage Clinic, Warton, nr. Preston. Foot readings are offered in clinic and remotely.